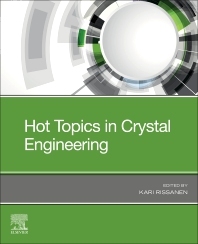 Hot Topics in Crystal Engineering covers the design and synthesis of single crystalline solid state materials, their properties and applications, focusing on the understanding and use of intermolecular interactions that constitute single crystalline materials. Many of the most modern materials, such as metal-organic frameworks (MOFs) capable of gas storage and separation, and selective entrapment of harmful substances, are the result of the rational use of crystal engineering. Topics covered in this work highlight breakthroughs in this rapidly developing field. This work offers a carefully chosen cross-section of the latest developments, some in their early infancy and some covered for the first time. Kari Rissanen got his MSc degree in organic chemistry in 1985 after which he pursued PhD studies in the Laboratory of Inorganic Chemistry at the University of Jyväskylä. The PhD work focused on solid-state structural chemistry of small organic molecules. Already during his PhD thesis work Rissanen started his own independent career as a researcher of the Academy of Finland (1988). Since then Rissanen has pioneered the research in supramolecular chemistry in Finland. Rissanen is one of the world-leading experts in supramolecular crystallography, weak intermolecular interactions, especially halogen bonding and anion–π interactions, and new methodologies in crystallography. In addition to his main expertise, Rissanen has also achieved international recognition in the design and synthetic chemistry of novel receptor molecules, new cyclophane hosts, uranyl salophens, and most recently sensor molecules and gelators based on coordination complexes. Rissanen’s research has focused on a multitude of chemical systems, but in all studies the governing feature has been the understanding of the interactions involved in the recognition and self-assembly phenomena, and subsequent design and synthesis of functional host and sensor molecules based on this knowledge. The detailed structural studies form the solid basis for the understanding and utilization of weak noncovalent, viz. the supramolecular interactions occurring in recognition and self-assembly events, visualized in the solid state by single crystal X-ray diffraction and solid state NMR, in solution by NMR and in gas phase by mass spectrometry. Rissanen is the first chemist in the history of the Academy of Finland to get nominated twice as the Academy Professor (1st term 2008–12 and 2nd 2013–17), the highest ranking academic position available in Finland. He has been awarded several national scientific prices and awards: Commander, of the Order of the Red Rose of Finland, 2016; Knight, First Class, of the Order of the White Rose of Finland, 2008; Finnish Academy of Science and Letters (1991, PhD thesis prize); the Magnus Ehrnrooth Prize in Chemistry (2005), and the Nanotech Finland Award (2010). Throughout his whole career he has been extremely active both nationally and internationally in various levels of science and university administration, funding and evaluation councils and boards. The major international and national administrative duties include the Finnish representative at the Management Committee of the COST Chemistry Actions D7, D11 (vice-chair) and D31 (chairman), the member of the Research Council for Natural Sciences and Engineering of the Finnish Academy (2004–06); the chairman (2005–06) and expert member (2007–10) of the Steering Committee of the Academy of Finland Nanoscience Research Programme, FinNano.